On the midnight of March 13th, 2012, MBC Wednesday and Thursday drama series The Moon that Embraces the Sun released the 6th OST for the drama, Only You One Person (aka The One and Only You) through major music sites. 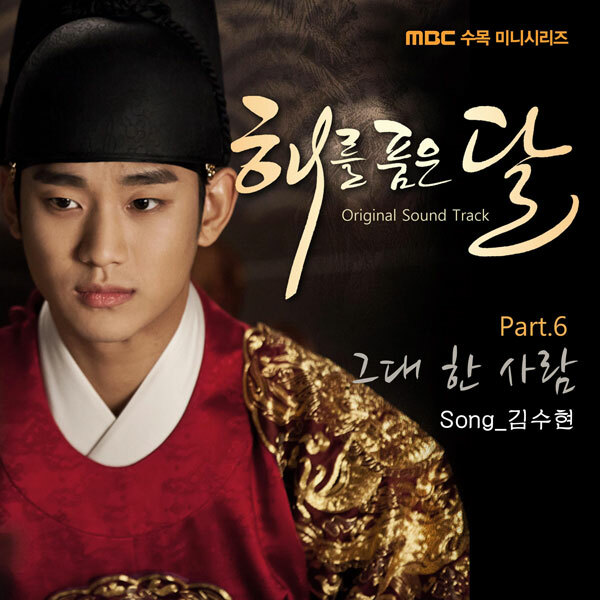 The song is sang soulfully by the protagonist of the series, Kim Soo Hyun. After the music is released, the song immediately became that popular search term of various portals, and ranked at the first few positions of various major music sites. Only You One Person is a sad ballad song by Lee Hwon who is played by Kim Soo Hyun to show his affection to Yeon Woo who is played by Han Ga In. The song allows the beautiful love to sublime, letting the crown prince who is obsessed with the first love to make perfect the love in the whirlpool of fated love. The song of The One and Only You is composed and written by producer Kim Chang Lak who also used to produce the Lucky Guy of SS501’s Kim Hyun Joong. He is also the fan of The Moon that Embraces the Sun. For the sake of getting near to Kim Soo Hyun who commits wholeheartedly in the shooting, he specifically produced this song, while after Kim Soo Hyun also expressed that he wants to sing the song after knowing about it. Kim Soo Hyun used to demonstrate his singing capability that is comparable to professional singer through an insert song Dreaming for TV series Dream High. This time, he shows a increasingly mature vocal with Only You One Person. His unique bass perfectly interprets the sad and moving weeping lyric.